In medium bowl , combine flour, soda and salt. Mix well with wire whisk. Set aside. In a large bowl with an electric mixer blend sugars at medium speed. Add butter and mix to form a grainy paste, scraping down the sides of the bowl. Add eggs and vanilla extract, and mix at medium speed until light and fluffy. 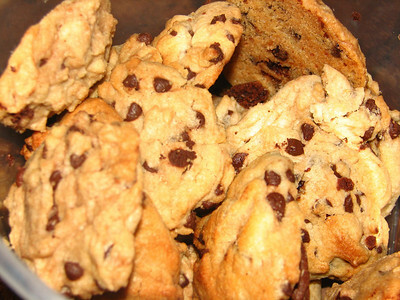 Add the flour mixture and chocolate chips, and blend at low speed until just mixed. Do not overmix. Drop by rounded tablespoons onto a cookie sheet (grease with some butter and sprinkle with flour), 2 inches apart. Bake around 10-15 minutes or until golden brown. Transfer cookies immediately to a cool surface with a spatula. Funny the last time I tried baking chocolate chip cookies, they turned out soft :( Wondered what I did wrong. I did preheat the oven.